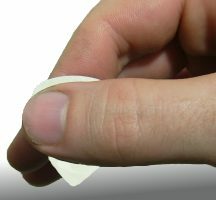 To begin with, place the pick between the thumb and the index finger of your right hand as shown in the picture (for a left-handed guitar the picking hand will be your left hand). 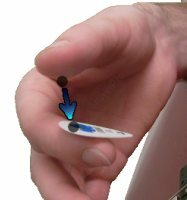 As a starting point hold the pick more or less perpendicularly to the guitar body. Now turn the pick a little as in the picture below. And You'll get more aggressive, harsher sound when playing with a distortion. 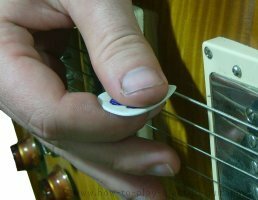 But most importantly, it'll reduce the rubbing between the pick and the strings, lowering the chance of getting the pick caught up in them, and consequently making the picking a lot easier. There's a variety of different picks with various shapes, thicknesses and sizes. Some will fit you better than others. It's a good idea to keep a bunch of different picks around when you are at the beginning stage: hard, medium, soft, big, small... practice with each one for a while, and sooner or later you'll naturally find which plectrum is really for you. The same thing goes for guitar strings. 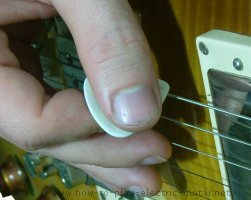 Usually, a harder pick used on a thicker strings will produce more massive sound. Although it can make your playing more difficult. Note that I do not mean to change the strings every half an hour just to check how they feel, it would be a real pain. You might experiment with a set of different strings when the time for restringing comes. And while we're on this here, I'd recommend to restring your axe once in a 1-2 months if you play a lot and still want to have a nice guitar tone. Practicing on older strings is also fine, they just will sound duller, and the thinnest strings will contribute some metallic vibrations to your tone. If you feel that all the strings except the thinnest one(s) (most likely the higher E string) are OK, you can replace only this string(s) and postponed the full restringing process for a really long time. OK, enough talking. Let's get started with the picking already.